These lines, of course, are from TS Eliot’s The Wasteland, a poem I have long-loved. I only recently learned that the phrase “a handful of dust” comes from a meditation by John Donne, part of a series of meditations and prayers called Devotions Upon Emergent Occasions and seuerall steps in my Sicknes. Donne wrote these meditations while recovering from a nearly fatal illness, they’re about health, pain, and sickness, and they’re quite melancholy. In this particular meditation, number four, Donne starts by describing each person as a little world, which is an idea that I love. “It is too little to call man a little world; except God, man is a diminutive to nothing. Man consists of more pieces, more parts, than the world; than the world doth, nay, than the world is. And if those pieces were extended, and stretched out in man as they are in the world, man would be the giant, and the world the dwarf; the world but the map, and the man the world.” And what is it that makes us so immense, that makes the air too little for this orb of man to move in? It is our thoughts, our imagination. “Enlarge this meditation upon this great world, man, so far as to consider the immensity of the creatures this world produces; our creatures are our thoughts, creatures that are born giants; that reach from east to west, from earth to heaven; that do not only bestride all the sea and land, but span the sun and firmament at once; my thoughts reach all, comprehend all. Inexplicable mystery; I their creator am in a close prison, in a sick bed, any where, and any one of my creatures, my thoughts, is with the sun, and beyond the sun, overtakes the sun, and overgoes the sun in one pace, one step, everywhere.” No matter how confined our bodies are, whether it’s because we’re sick or imprisoned or merely stuck in traffic or a waiting room, there’s no limit to where our thoughts can travel. It’s like Pierre as a prisoner! “The harder his position became and the more terrible the future, the more independent of that position in which he found himself were the joyful and comforting thoughts, memories, and imaginings that came to him.” We might all be in the gutter, but we can look up at the stars! We might have to “live in the trunk of a dead tree, with nothing to do but look up at the sky flowing overhead,” but our imaginations and memories and reveries can soar with the flowing skies. And, as Donne tells us, when two of these little worlds come together, in friendship, or in love or marriage, we have everything, we have everywhere. Here’s Back in the Good Old World by Tom Waits, because I was just listening to it, and it seems to fit, somehow! Peel and core the quince. Put it in a small pot, with enough water to cover the fruit by about an inch or two, over medium high heat. Bring to a boil, and cook for about 1/2 hour till soft but not completely mushy. Drain, stir in the sugar, and cook for a bout five minutes to combine the fruit and sugar. Set aside. Lightly butter a small roasting pan. Mix the beans with the onions and quince. You only need about 1/2 cup quince, so if you have any left over eat it with pancakes, bake it in a cake or add it to a trifle. In a small bowl mix the butter, balsamic, and brown sugar, and stir this into the beans as well. Season with salt and lots of pepper. 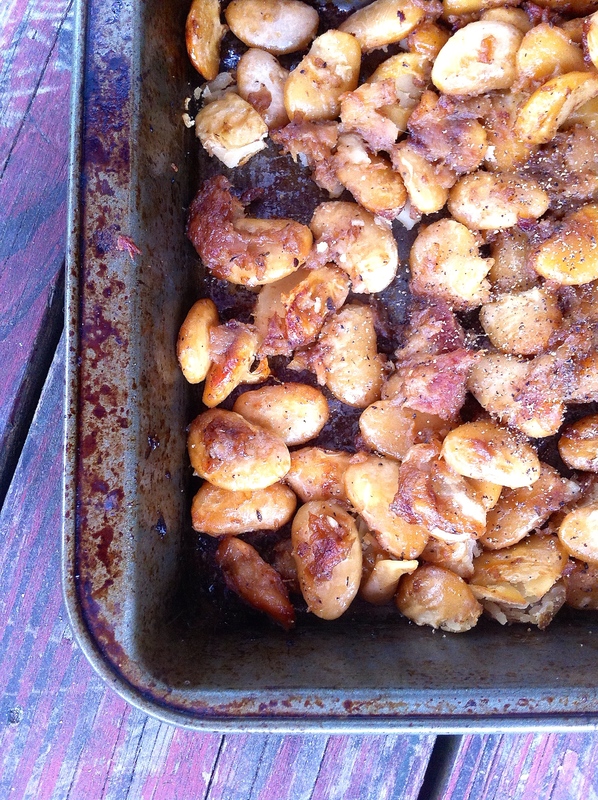 Spread the beans in an even layer in the roasting pan. Cover with foil. Cook this way for about 25 minutes, then remove the foil and continue to cook until everything is browned and caramelized. As the pan dries out, add a splash or two of white wine, mixing it in and using it to scrape all the good caramelly bits from the bottom of the pan. 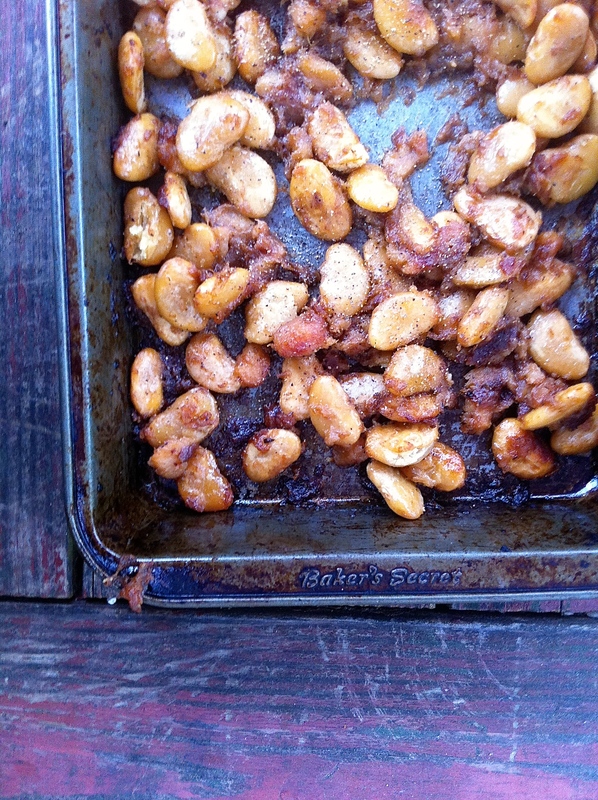 This entry was posted in beans, vegetable side dish and tagged baked beans, butter beans, butterbeans, caramelized onion, quince, quince baked beans by Claire. Bookmark the permalink.